Jay-Z has hit out at accusations the lyrics on his latest album 4:44 are anti-Semitic. The rapper, 47 shut down the claims about his track The Story Of OJ during an interview with Elliott Wilson and Brian "B.Dot" Miller on their Rap Radar podcast. Insisting the accusations were 'hypocritical', the musician said it was difficult for him to take the claims seriously because he had 'exaggerated every black image in the world'. Jay Z commented during the interview that his lyrics for the song could even be interpreted as a compliment. 'I pretty much said, if you want to be good at property and things like that, follow this pattern,' he explained. 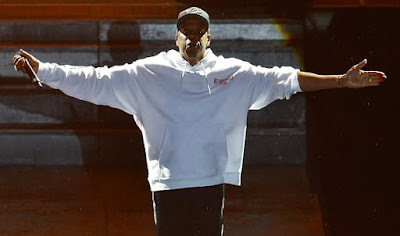 After the song was released in June, the Anti-Defamation League said it did 'not believe it was Jay-Z's intent to promote anti-Semitism' in the track. In a statement released to Rolling Stone magazine, the Jewish organization stated: 'The lyric does seem to play into deep-seated anti-Semitic stereotypes about Jews and money. » Jay-Z’s Album 4:44 Not Platinum?? ?